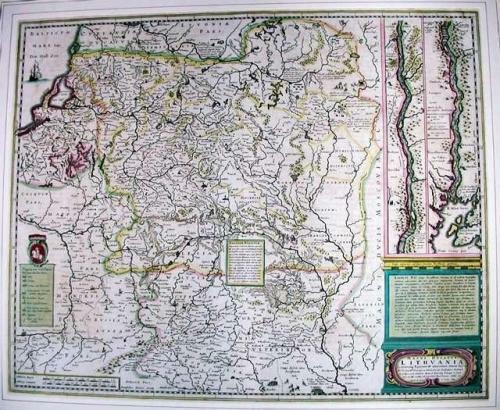 A beautiful antique map of 17th century Lithuania, incorporating present day Belarus and the Ukraine. The Commonwealth of Two Nations (Poland and Lithuania) stretched from the Baltic Sea in the north, to the Black Sea in the south. On the right of the map are two strips showing the course of the Dnieper River into the Black Sea. Derived from Blaeu's 4-sheet map published in 1613. On the verso a description, in French, of Lithuania.